Lord Swaraj Paul, one of the most successful Indians in the UK, is the third Asian to be nominated to the House of Lords. A gentleman with winning manners and endearing qualities, he set up a small steel manufacturing plant in Huntindon near Cambridge in 1968. THE foreign policy contours of President Bush's second term slated for mid-January next year, are beginning to emerge in some detail. Former National Security Adviser, Chairman, Joint Chiefs of Staff, and Secretary of State till recently, Gen Colin Powell has given way to Dr Condoleezza Rice. Chitra Mudgal is a rare writer in Hindi literature, combining many facets in her personality. She is a born rebel, a dedicated trade unionist, social activist, virtual demi goddess to slum dwellers and, at the same time, a dedicate house wife. I went home to Delhi for Diwali holidays. During this period I also travelled to my second home, which is Amritsar. I took the train called the Shatabdi Express from Delhi. (the series of comparatively faster running trains). This was close on the heels of my train travel by the ‘Acela’ or Amtrax, from New York to Boston. THE emotions that Lt-Gen J.J. Singh showed while speaking to media persons of his experiences in Kashmir have caused a good deal of comment. The general reaction seems to be that, now that he has been appointed as the next Chief of Army Staff, he must behave like a tough - if not ferocious - warrior. International Day of Solidarity was observed on November 29 in some parts of the country, but not in the national capital because of the lackadaisical attitude of both the Indian Council for Cultural Relations and the Ministry of External Affairs. Jalandhar, before enrolling at Massachussets Institute of Technology. Q: Do you agree with the view that the nation's drinking culture is going out of control? A: I don't drink or smoke. I am a vegetarian. I am the wrong person to comment on it. But there is considerable amount of drinking in Britain. There is a concern that drinking is on the rise. But many social groups are changing their drinking habits for health reasons. In certain quarters, drinking has gone down. For example, there might hardly be a drink in a business lunch these days. It is becoming quite fashionable to order a glass of water. Restaurants are quite happy because they make more money on selling bottled water than on selling alcohol. The law is very strict on drunk driving. If two people are going out, they exercise the option that only one of them will have a drink so that the other can drive. If you are caught drunk driving, you can lose your licence. Pub culture is expanding especially among the youth and women. Q: Would you like to be categorised as "anti hunt" since your love for animals is well known? A: Anti hunting and pro-animals are different things. I am against cruelty of any kind. Buddha divided life into four categories - human life, animal life, bird life and vegetable life; the choice was left to you to do the least harm and not kill for pleasure. Some people refer to his philosophy on vegetarianism. If I found something more beneficial, I would give up vegetables, if necessary. A lot of Jains in India don't even eat root vegetables. Q: Will the ban on fox-hunting give a boost to the efforts for a ban on game shooting as a blood sport? A: I don't think legislation would give boost to something. The pros and cons are discussed by the courts, the Press and Parliament before a law is enacted. Laws are to see what is best for the people - the criterion on which I would vote in Parliament. Q: Will the ban on fox-hunting, severely criticised by the media, affect Mr Tony Blair's prospects in the elections? A: (After a reflective pause) I don't think Mr Blair's election depends on hunting or anti-hunting. It depends on his performance as Prime Minister, the performance of his government and the performance of his party. Q: Are you satisfied with the Asian representation in the House of Commons and the House of Lords? A: It is a great step forward. There are outstanding Asian people in this country. But we should not think in terms of representation of communities. Every Asian and every minority community believes that they are British. It is no mercy from anybody. The people of British origin and other minority communities have gone to both Houses purely on their own merit and ability. I am proud to be there because I am British and I contribute to the British society. Q: Are MPs and Lords of Asian origin afforded equal opportunity inside Westminster Palace in raising issues concerning the Asian community? A: The MPs and the Lords of Asian origin feel that they represent all the British people and so, they take up issues of every community. Q: Do you think the security at Westminster Palace is adequate? A: It is really a question of choosing between security and the right of the people to meet their representatives. It is the security officers' job to ensure security. They do a marvellous job. Till 2001, the police was not allowed in the Westminster Palace. September 11 changed it all. Q: How would you rate Britain's relations with India? A: Great. We have strengthened ties in such areas as defence, science and education. We are doubling from next Monday the flights to India. Q: As the Ambassador of British business, what steps are you taking to encourage Indian businessmen to invest in Britain? A: We in Britain and in London, have been creating a conducive environment for Indian companies interested to invest here. Britain is a very open country and takes pride in the fact that once a company is set up here, it is treated as a British company. Q: What about the Identity Cards Bill which figured in the Queen's speech? A: I am in favour of identity cards. Most Europeans have it. If they give me today, I will be glad to take it. I will be overstepping my mark if I assume what Parliament will pass. Q: What about the Prince of Wales' recent observation on the hopes and aspirations of the young and the learning culture in schools? Was the intervention of 10, Downing Street necessary to defuse the row between the Prince of Wales and senior Cabinet Ministers? A: People have a right to say what they want as also a right to criticise. Thus, there is a possibility of a public debate. This is most enjoyable in Britain because issues get discussed in public and people make their own judgement. I am a great spokesman of democracy and that is why I am proud of my Indian origin. India is one of the few countries which has upheld democracy and we should all be proud of it. One does not know what necessitated the intervention of 10, Downing Street. If somebody becomes unhappy, there will be another debate. The newspapers need something to write about. What can President Bush do in his second term? THE foreign policy contours of President Bush's second term slated for mid-January next year, are beginning to emerge in some detail. Former National Security Adviser, Chairman, Joint Chiefs of Staff, and Secretary of State till recently, Gen Colin Powell has given way to Dr Condoleezza Rice. The first black women and only the second lady in America's history to grace the powerful office of Secretary of State, Rice is expected to push the President's line to the hilt. On another plane, the President, who has won by a large majority of the popular vote and belonging to a party that has improved its lot on the Capitol Hill with nominations to the judiciary still to follow, will have little difficulty in pushing forward on a fast track what many term a hard-lined foreign policy agenda around the globe. Of special interest to Indian readers, however, are the hotspots of Afghanistan, Iraq, the Middle East, Iran, the Indo-Pakistan standoff, and the handling of the China-Taiwan confrontation. A better focussed, more assured and final term Bush, unfettered by the earlier restraining and often compulsive briefs of the likes of Gen Colin Powell is now unlikely to retreat from Iraq in a hurry, even if it means the beefing up of the troop force levels there, to first ensure an orderly and safe January 2005 election and then provide an acceptable and adequate stabilisation of the country, with a possible pullout of the armed forces by the middle of his second term. If the UN or other nations do not oblige by then, he could turn to South Korea and the American complement in NATO to foot the troop presence. With the Presidential elections behind him, an easier passage of the treasury bills and special monetary requirements, and Afghanistan with its first-ever election in decades out of the way and an American supported Hamid Karzai likely to hold sway indefinitely, Bush will be able to wage more easily and confidently the war on Iraq and international terrorism. The Taliban now uprooted out of Afghanistan and the Al Qaeda without a permanent base, could mean a lesser threat to the US mainland and a slowing down of the war on terror outside America. It could also translate into a more thorough and deliberate attention in the direction of the 'rouge' states like Iran and North Korea. With the American squeeze on Iran already underway because of their nuclear capability and aspirations in the enriched uranium field, the latter's temporary agreement with the EU notwithstanding, a stronger military initiative and a preemptive rising well beyond mere economic sanctions in the direction of Iran is a clear possibility in the months ahead, especially with US troops already well poised in Afghanistan and Iraq. This time round there will be no Colin Powell to even render a cautionary approach. The huge cost of the Iraq war and the non-availability of any viable political options in North Korea or Iran, will only make Bush's job all the more difficult. But Bush has already vowed to keep the world peaceful, and in his perception both Iran and North Korea direly threaten world peace. Yasser Arafat is no more. And an uneasy power battle is in the offing as and when hostilities between the Palestinians and Israel again flare up. President Bush has a difficult job ahead of him to broker a peace agreement. Will Bush push for the creation of a Palestinian state with all the vigour and resolve and keep both Israel and powerful Jewish lobby in America in good humour and on his side? 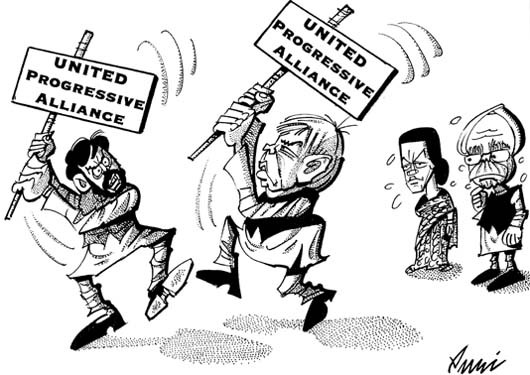 Nearer home, the Indo-Pak Kashmir resolution presents a conflict of interests all round. India will not accept any alteration of the boundary in Jammu and Kashmir. Pakistan will not accept the formalisation of the Line of Control into an acceptable international border. Thus, the chances of both countries agreeing to demilitarise any part of Jammu and Kashmir or have the area administered by an outside force appear remote. Though Pakistan would gladly accept America as a facilitator or even an arbitrator in Kashmir, India will not accept any external interests in this resolution. The US interest at the best of times in the subcontinent has mostly been nuclear war oriented, implying that they take very seriously the threat of a nuclear confrontation or nuclear accident or transfer to terrorists or hostile elements of a low yield tactical nuclear weapon in the region. In my view, President Bush will only put his prestige upfront if he is assured of a solution in the Indo-Pak standoff. Therefore, it is in the interest of both countries to find an amicable solution to the Kashmir tangle soon. Beyond a stage, with America definitely needing Pakistan's support in the Muslim world, it is a moot question how far is the US prepared to push it for a solution to Kashmir. Many here in America fear that once their presence and prestige in Pakistan goes under, there is no frontier post left to protect all the way through Afghanistan, Iran and Iraq. This is what Indian foreign policy makers should be mulling about in their search for a solution in Kashmir. The Taiwan Strait standoff between Taiwan and China, coupled with the latter's importance for America in keeping North Korea's nuclear weapons programme under some check, imply that as far as India is concerned the US is unlikely to take a hard stand against the communist giant if ever India and China again have a confrontation. Alongside, with Russia again flexing its nuclear missile muscle with their recent test, President Bush is likely to have many a problem on his plate. It would make for perfect diplomatic sense if India and Pakistan were to resolve the Kashmir tangle soon before they risk the chance of becoming somewhat irrelevant in the foreign policy formulations of the major powers in the world arena. Chitra Mudgal is a rare writer in Hindi literature, combining many facets in her personality. She is a born rebel, a dedicated trade unionist, social activist, virtual demi goddess to slum dwellers and, at the same time, a dedicate house wife. Putting together all these traits make Chitra Mudgal, the novelist. She was aptly decorated with Birla Foundation’s ‘Vyas Samman’, the first woman to receive this prestigious award for her novel ‘Awwan’. The selectors hailed the fiction as one of the greatest literary works in Hindi. Some critics call it the best novel of the last decade of 20th century. ‘Awwan’ means potter’s kiln in which earthen vessels of different sizes and shapes and, sometime statues and toys of mud, are baked; some of them turn out to be excellent pieces of art. The kiln, in fact, is symbolic of the struggle of factory workers. The novel represents her deep and long association with the trade union movement in India. The plot of ‘Awwan’ was conceived following the murder of a committed trade union leader, Shankar Guha Neyogi, who was a regarded a god among the workers of the Bhilai steel plant. “I started writing the novel after Neyogi’s murder”, she says and adds: “The trade unions which were set up to fight the system have sadly become the system themselves, ridden with politicisation and criminalisation. Dirty politics has well and truly entered the trade union movement”. Traits of a rebel were embedded in Chitra since childhood even though she came from a feudal family and also enjoyed the comfort and luxury of the household of her father, a senior Naval officer. Her father’s residence was in the Navy’s protected area, surrounded by slums of factory workers who used to trespass through the posh colony of officers to factories. This saved a distance of 3-4 kms. Her father decided to put barbed wires round the colony but the trespass did not stop as the workers cut the wires. Then the Naval officer decided to raise stone wall around the complex. Subsequently, Mumbai’s noted trade union leader, Datta Samant, came into the scene. He met Chitra’s father in her presence and urged him not to cause inconvenience to poor workers. Chitra, who supported Samant’s stand, says she was so impressed by his dedication to the welfare of factory workers that she herself decided to join the trade union movement much against her father’s wish. Samant had been her guide and philosopher till he was murdered, which, she says, “shattered her”. Chitra revolted for the second time when she married out of her caste (kshatriya) to a Brahmin, Awadh Narain Mudgal, a journalist, who later became the Editor of ‘Sarika’, a Hindi literary magazine, which was later closed down. Following protests from her father, the couple had to live “in a hovel in a slum”. Now 58, she lives in a modest house in Delhi and continues to work in slums. 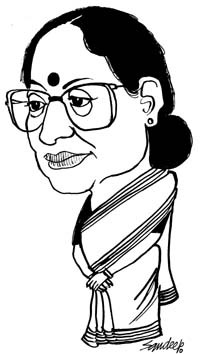 She also devotes time for trade union activities, carrying out Samant’s legacy. Another trade union leader of Mumbai, Mira Tai, has also left her indelible imprint on Aparana. Mira Tai was murdered as her activities affected the interest of Mumbai’s high and mighty. Tragedy struck Chitra and her husband in 1993 when their daughter and son-in-law died in a car accident near Delhi. “Awadh has not been able to reconcile to the tragedy”, she says and keeping indifferent health. As a dedicated housewife, she looks after him and leaves home by mid-day for her other activities. “When I meet a young girl in slums, I feel, as if, Aparna (her daughter) is struggling to become something”, she says. With all her preoccupations, Chitra has been working on a new novel ‘Ek kali, ek saffad’ (one black, one white) representing dices of the carom board. The red one represents the queen. The novel is about the present system that exploits the people in general. Those who control the system are corrupt and criminal and the black dice represents them. Chitra has a lot to do on the fiction and needs undisturbed time to complete it. The title of the book may change, she says. As I boarded the Shatabdi from Delhi, a sharp contrast was evident on various interesting counts. Since they were so many, I could spot and not wanting to lose the chronology of my observations, I decided to keep a mental account of these due to which I am able to share vividly and make the readers’ journey with me in a limited way. As we stepped into the train, the comparisons and contrasts became evident right away from the first announcement as I heard. And the unique differences immediately attracted my attention while emotionally moving me at the same time. It was clearly the product of our two different cultures and two different life styles. And unless one experiences comparatively, one cannot easily appreciate and even relish or reflect. I had taken for granted certain scenarios or situations or happenings till this comparison came alive. At times the situation was heartening while at other, a relief. But it was all getting etched in my mind subconsciously, perhaps sensitively, as I later realised. Here is a faithful and a graphic recall. *An announcement in English and Hindi welcomed us on board. (The comparison is of Executive Classes). A young and well-dressed sari clad female railways officer came and served us Nestle Éclairs. Then followed the newspaper distributor, with choices of papers one could pick. And we could take more than one. The ‘Shenai’, instrumental music too, started to play. It was a perfect spiritual music for the daybreak. *Alongside we were all handed over big size mineral water bottles with paper glasses! I heard repeated warnings not to leave the bottle behind to prevent misuse of empty bottles through recycling. *Contrast this with the United States. Drinking water fountains are inside all the trains. No one comes to offer you a mineral water bottle or give you an empty glass. Éclairs are out of the question! And if one wants to have bottled water one will need to go and buy one from the catering car. Being served is not done. And announcement of the kind of destroying or taking the bottle with you does not arise! Are you joking? *Within minutes of train moving, we all were served with hot water in neat flasks with coffee, tea, powder milk, sugar and biscuits. The waiters serving willingly offered an additional serving. I noticed that the train for a long distance had to persistently blow the horn. For all along the railway lines were slums without protective walls. And there was a risk of any one accidentally getting run over. There was, as I observed not a yard of space, which was not occupied for quite a distance till the refreshing green fields arrived. Messages regularly flashed by on the message screen “to keep the train clean” and “to disembark only when the station arrives” and that “your safety is our concern”. But a hanging door off the hinges between the two train carriages and wet washroom without the toilet paper were indictors to the contrary? She said everything in life is a “mixed bag”. “It depends on what one is looking for”. And I could not resist asking her what was she looking for here in India. She said, “history, civilisation, warmth, care, people, willing service. And India has abundance of all this. And more”. I could not agree more. But I wondered when we had this inherent treasure why we couldn’t be the best? Yes. Only if we developed the right work ethic across all ranks. Independent of inspections, audits and rewards! THE emotions that Lt-Gen J.J. Singh showed while speaking to media persons of his experiences in Kashmir have caused a good deal of comment. The general reaction seems to be that, now that he has been appointed as the next Chief of Army Staff, he must behave like a tough - if not ferocious - warrior. Those who react this way are, no doubt, focussed on the militants, now mostly from across the Line of Control, and the possible impression of weakness that this sort of emotional behaviour might convey. The situation in Kashmir, however, requires one to go beyond the black-and-white paradigm of war against an enemy. If Indians really consider Kashmir to be a part of the country, the impact that the Indian Army has on the Kashmiris is far more important than the impact one may or may not make on those that Pakistan sends to continue the insurgency. There appears to be a plentiful supply of poor young men from across Pakistan’s backward belts - and even beyond - who can quite easily be brainwashed to become cannon fodder in Kashmir. A ferocious face of the Indian Army is only going to make the brainwashing of those boys easier. I have been reminded by this unnecessary controversy of the stories I have heard from Kashmiris over the years I have spent covering the insurgency here. The impact that the humane face that Kashmiris have sometimes seen of particular Indian Army officers can barely be described. Its value for the integration of the Kashmiri people into the national mainstream is worth its weight in gold. The story that particularly stands out in my mind is of a girl who got tragically caught in the maelstrom of violence. She was in her teens when her striking beauty caught the eye of a local militant, whose group turned up at her home to demand that she be married to the young fellow. Her mother and elder brother begged them not to insist on having the girl but were forced to give in when the group abducted and threatened to kill another of the girl’s brothers. Although she soon fell in love with her husband, she went through hell when the forces, tipped off about his involvement with the Hizbul Mujahideen, turned up often to search the house or drag her away for interrogation. When she recounted her travails to me, however, she had tears in her eyes as she described one particular army officer. He had come and sat down beside her while she was making tea on a wood fire, she said, and told her that she reminded her of his two daughters. They play and have fun, he had told her, but she had ruined her life by marrying so early. What the girl remembered was that that officer too had had tears in his eyes as he had thus spoken to her. That chance encounter did not wipe out the scars of her encounters with more brutal army men, but it did much to negate those other memories. I remember also the stories I heard from the very spirited sister of a young man who had become “chief commander” of one of the smaller militant groups. Their house was frequently searched, of course. But though this young woman recounted stories of traumatic, fear-filled nights during some of those searches, she also spoke with great respect about the courtesy and gentlemanly behaviour of the young officers who had led some of those searches. It is largely because of the gallantry - and courtesy amid the tensions of a battle situation requires special courage - of such officers and their forces that Indian tourists can today roam about the valley so freely, interacting in a friendly way with ordinary Kashmiris. It is a stark contrast with the paranoia with which Israelis view the prospect of driving through Palestinian areas, particularly the Gaza strip, or of Sinhalas that might need to go to the Jaffna area. At a time when the relative popularity of the Mufti government is in tandem with the gradual withdrawal of armed forces, weaning away at least some Kashmiris from the path of secession, General Singh’s feelings last fortnight might well have a salutary effect. It is a time, after all, when the hollowness of the “shock and awe” strategy of even the mightiest military on earth has been demonstrated - as has the ability of subversive propaganda to demonise military operations. Humaneness is likely to go much farther than unnecessary macho behaviour. Till two years ago, the ICCR together with the MEA, were organising an elaborate programme on the day. But then, no programme was organised either this year or last year. The Indo-Arab fraternity staff have written an elaborate protest note for bypassing this major occasion to External Affairs Minister K. Natwar Singh. Several others have been critical of the ICCR head Najma Heptullah. Needless to say, this year the significance of this day would have been greater following Palestine Liberation Organisation Chairman Yasser Arafat’s death very recently. Perhaps to make up for this rather obvious lapse on the part of the Indian government, Indo-Arab forums in Mumbai and Hyderabad organised functions on the day. In the Capital, the Arab League together with the United Nations is hosting a function in support of the Palestinians on December 11 at the India International Centre. For the IIC function, a whole list of speakers are lined up - Palestine Ambassador to India Musa Osama, UN Information Office Director Shalini Dewan, Arab League Ambassador Dhabiya Khamis, Indo-Arab Fraternity general secretary K.L. Malhotra. In the sudden passing away of well known novelist and theatre scholar Shama Futehally Chowdhury, there has been a setback to the Uphaar tragedy. Her forthcoming book focussed on this fire tragedy and the pain it unleashed on the survivors. For the last two years, Shama had been writing this book. Midway through, she suffered health problems. When I met her last August, she had told me that she had been suffering from acute digestive problems. On Dec 2 morning, her friend Rakshanda Jalil called up to convey this sad news. I will remember Shama for not just her writing prowess but also the fact that even when her bureaucrat spouse Javed Chowdhury was the Revenue Secretary to the Government of India, she did not throw her weight and name around. The Visual Arts Gallery (Habitat Centre) is coming up with a big offbeat show ‘Singular Identities’ (Dec 9 to 14). To quote the curator of the show, Alka Pande, “Is there a singular identity within the global context, when the world is shrinking and turning into a global village? The title itself is meant to provoke and tease both the practitioner and the viewer to relook at identity. Have a dekho and find out. Guru, who is the centre of Sadh Sangat, is the divine personality to set bewildered jivs on the right path. Many wish to put on ochre and yellow robes and be venerated as ascetics. Neither the robe nor the colour makes an ascetic. The man who wishes to be an ascetic without first cleaning his thoughts of anger, greed, ego and vanity is chasing a mirage. No one can persevere in the search for Truth without having discarded worldly desires. After sometime, none of these desires will trouble the devotee. With a perception to show the way , correct knowledge of the way and with regular practise, the devotee will achieve his goal. Let the laws be read out by a man who it known to be good and wise. Though they may be fair and just, to be sure. If read out by a man, cruel and greedy, they take on the colours of the man.